The largest in Ukraine and the manufacturer of the electrotechnical equipment, famous in the world, for the enterprises of fuel and energy complex extracting of processing industries and power engineering specialists "Novokakhovsky Electromechanical Plant" invites you to business cooperation. The enterprise was founded on base of structural division of JSC Yuzhelektromash. During the period since 2000 more than 600 types and modifications of explosion-proof and common industrial asynchronous electric motors, synchronous electric motors and generators were developed and mastered. The strong production, research and experimental base, modern technologies and qualified personnel allow staff of the enterprise to create the quality equipment in short terms, a long time to support its operational opportunities. At the enterprise the quality system covering all cycle of production, marketing and studying of the market, scientific researches and service is developed, introduced and certified. Products which are turned out by TPO "NKEMZ" meet the requirements of normative documents and inquiries of consumers that allows it to compete successfully in the domestic and world market. 1. Synchronous electric motors: - the SDN(Z), SDS (Z), SDN (Z)-2, SDRZ, SDV, SDM, SDMZ-2, SDMZ-4 series, etc. 2. Asynchronous electric motors: - the A4-355, 400, 450 series of a dimension, DAZO4-400, 450, 560, 630 of a dimension (6000V), A4-500, DAZO4-500 (10 000B), with power from 200 to 800 kW. - the AOD 560 series of a dimension with power from 315 to 2000 kW, the AOD 2-speed series, vertical series 4AOV, AODV, with power from 200 to 500 kw, the BACO, ACBO, BACB series, one - and 2-speed the DAZ, DAP type, the AKZ, joint Stock Company, AZ, A 12 and 13 series of a dimension, AZD. 4. Common industrial electric motors:-series 4AMU, 5AMU, 6AMU, 5A355, AIR315, 355 of a dimension, AO3-400, AMU, AO3-355, 4AMN, 5AN with power from 0,75 to 400 kW. TPO "NKEMZ" of. New Kakhovka offers carrying out on technical requirements of the customer of research works, development of documentation and production of prototypes and small parties of the following types of special electric motors: - modifications of common industrial, explosion-proof series 4AMU, 5AMU, AMU, AIR, AO3-400, 5AM, 6A, AIMM, AIU, VAO2, VAO4, VAO5, VAOK, DAZO, A4, in a power range of 0,5-2500 kW of 220/380B/660B, 6000B, 10000B. 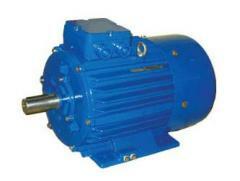 The electric motors acquired at our enterprise are provided with guarantee maintenance. Electric motors the three-phase asynchronous short-circuited explosion-proof VAO2-355 series are intended for the drive of the stationary machines and mechanisms used in coal, chemical, oil and other industries. Execution on explosion protection - PB 3B (Exdl for export deliveries). A complete range of products and services Novokahovskij Elektromehanicheskij Zavod, TPO. All information about Novokahovskij Elektromehanicheskij Zavod, TPO in Novaja kakhovka (Ukraine).